Roast chicken. Who doesn’t love roast chicken? To me, it evokes a feeling of togetherness, family togetherness. 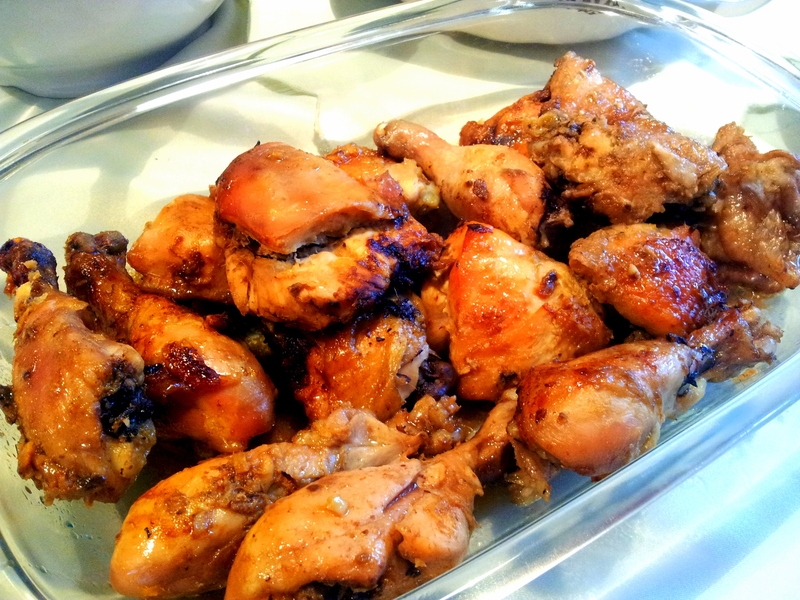 My sisters and I make this roast chicken every time we’re in Naivasha, or every time we have some sort of gathering. It is simple and quick to put together. Each of us has a different spin on the recipe; Lydia adds soy sauce; Gathoni loves her herbs and me.. I like lots and lots of garlic! Here is the recipe… It’s a rough guide really, you can throw in whatever you like. But the lemon and orange is a must. I love the citrus tang it brings to the chicken, it compliments the warmth of the garlic and ginger. 1 whole bird, whole or cut in to pieces… entirely up to you. Herbs; I use everything from rosemary, thyme, parsley, mint. It is best to use fresh herbs rather than dried. In a bowl, mix together the lemon and orange juice, garlic, ginger, salt, pepper and your finely chopped herbs as well as a little olive oil. In a freezer bag or plastic container mix this with the chicken and leave in the fridge for at least one hour. Bring the chicken to room temperature before laying the pieces out on the roasting tin. Skin side up. Add the orange and lemon halves you squeezed earlier, whole garlic cloves and sprinkle over salt, pepper and a little olive oil. Cover with foil and roast for 30-40 minutes. In the last 10 minutes, uncover the chicken to crisp up the skin. I love me some crispy chicken skin! Remove the chicken and let it rest, covered for 15 minutes. When ready to serve, pour the gravy over the pieces. Serve with a salad or roast potatoes. This chicken is great for Sunday lunch, for those trips to Greenpark in Naivasha it is absolutely perfect! This recipe is definitely for the heart and soul of my cooking, my beautiful sisters!